At a well-attended investor conference in South Sudan’s capital in early December, President Salva Kiir declared that the world’s newest country was “at last safe” and open for business. On December 15, fighting erupted in Juba that has swiftly spread beyond the capital along ethnic faultlines, exposing the failure of national reconciliation efforts, the limited influence of generous foreign sponsors and the reluctance of rebel fighters-turned-statesmen to give up the tactics of bush conflict. Whether South Sudan tips into a broader ethnic war or draws back from the brink largely depends on two men who have long tussled for power: the president from the dominant Dinka tribe and the ambitious deputy he sacked in July, Riek Machar, a Nuer. The United States and other Western backers of the new nation are scrambling with regional African states to broker talks, but have limited leverage to end fighting that has killed hundreds of people and driven 40,000 to UN bases for shelter. Failure to halt the escalation could have wider fallout in an already volatile region. Sudan may be drawn in if there is a threat to oil fields from which it derives vital fees from pumping crude across its land. And other neighbors fret about a descent into chaos. Uganda has already sent troops to Juba. Both leaders say they are ready to talk. But old habits die hard. Kiir said he was the target of a “foiled coup” and rounded up rivals. Machar slipped away and has mustered militia forces. “I am in the bush, and I am trying my best to have a better negotiating position,” Machar, 61, who holds a doctorate from Britain’s University of Bradford, told Reuters on a crackly mobile phone line from an undisclosed location. “Opportunities were certainly missed to engage in more robust preventive diplomacy over the past few months as the political crisis began gathering momentum,” said John Prendergast, member of a US group of intellectuals that cajoled Washington to back South Sudan’s split from Sudan. In spite of Kiir’s confident comments launching the December 4-5 investment conference, a showdown had long been brewing with Machar, who has made no secret of his presidential ambitions. For almost a year before Machar’s dismissal, the two men’s relationship in office was defined by “miscommunication or mistrust or silence”, said former culture ministry undersecretary Jok Madut Jok, who left his post in April. The powerplay caused stasis in government, and most worryingly derailed crucial efforts to build a program of national reconciliation between bigger ethnic groups, such as Dinka and Nuer, and the dozens of others that have long clashed over control of the south’s scant resources. Jok, now chairman of the Sudd Institute think-tank, described how Machar formed a committee to draw up a “practical, scientific” plan to rebuild ethnic relations, only to have it disbanded by Kiir, who put church leaders in charge to “focus on praying away the woes of South Sudan and nothing more.” Those who know the two men give similar accounts of the two characters on whose shoulders so much rests. “Anything short of the two men sitting down and trying to work it out will not work,” said Jok. But bringing the two together for now has hit deadlock. Kiir’s government has refused to release the group of rival politicians he detained. Machar says they must be freed as they are the ones who will handle any negotiations. Much may depend on Kiir’s reputation as a conciliator, often bringing in rival militias even though it could mean putting political influence before competence in government. Eric Reeves, a fellow American activist for South Sudan with Prendergast, said Machar needed to be convinced that prolonging any ethnic conflict would mean he would lose US or other Western support. “But there is no real leverage,” he said. The United Nations plans to beef up its peacekeeping force in South Sudan, where the Akobo UN base was overrun and looted by Nuers who are blamed for killing 11 Dinkas sheltering there. 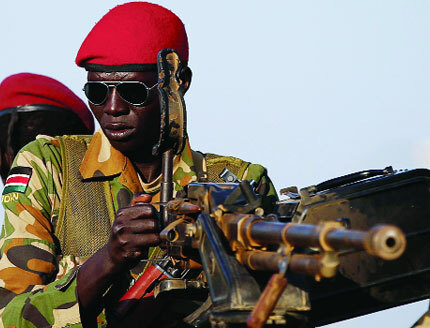 But the patchwork nature of the SPLA army and shifting loyalties means there is little chance of turning the UNMISS force into a robust intervention brigade like the one that quelled a rebellion in next door Democratic Republic of Congo. “If you don’t know where your enemy is coming from, or who your enemy is, it doesn’t really matter how heavily armed you are,” said Reeves. US President Barack Obama said on Saturday that any military effort to seize power would end US backing. His envoy, Donald Booth, was in Juba on Monday talking with Kiir. Fighting has already reached oil fields, near Sudan’s border, cutting output by 45,000 barrels per day (bpd) to 200,000 bpd. That hurts flows that are the source of 98 percent of land-locked South Sudan’s revenues. It is also vital to Sudan, which lost the fields when the south seceded but relies on fees from oil going through its pipeline to the Red Sea. A row over undefined borders, oil fees and security brought the new neighbors close to war last year. A South Sudanese academic, who asked not to be named, said Sudan could move on the fields if the fall in revenues started to bite and would worry about the deployment of troops from Uganda, which supported the south’s SPLA in the war with Khartoum. Ugandan army sources said the troops would help secure Juba. Jok said Washington and its allies might have steered South Sudan on a safer course if a pell-mell rush to support the new nation had come with more state-building conditions earlier. “You might even say they (the international community) did too much to let these leaders off the hook from their responsibility to steer their country to stability,” he said.